Offers innovative solutions to the protection of breakout areas and also provides ease of removal when inspection or maintenance of cables is required. 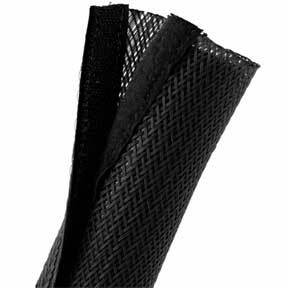 This polyester expandable sleeving is flame-retardant and halogen-free. It offers durable abrasion resistance in a wide range of industrial applications. Hook and Loop Cables Sock makes your cable management easier. It helps you hide your cables and keep the walls tidy. You can manage cable setups at your office or home appliance setup. The Hook and Loop makes it convenient to add or remove cables from the sock. Order them at SF Cable and get them delivered at your doorsteps. SF Cable ensures the quality of the product by sourcing products only from ISO 9001-2000 registered manufacturers. All products are environment friendly and you also get commendable after sale services from SF Cable.